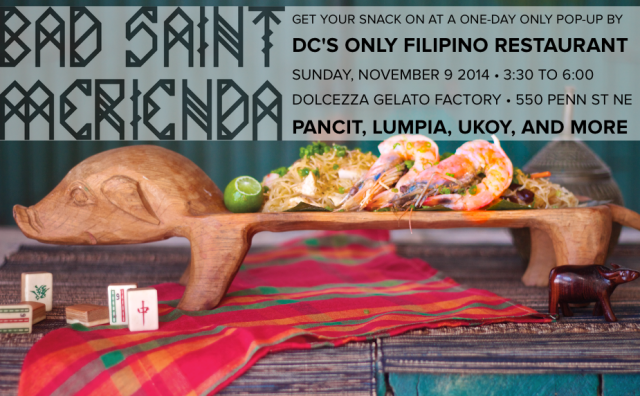 “What: Bad Saint, the District’s only Filipino restaurant, is set to open in Columbia Heights this winter. The restaurant will be under the ownership and direction of Nick Pimentel of Room 11 and Genevieve Villamora. Chef Tom Cunanan (Ardeo/Bardeo, Tarsier Catering) will be heading up the kitchen. Curious diners won’t have to wait for winter to acquaint themselves with Bad Saint’s menu: The team will be bringing Filipino food’s greatest hits to Dolcezza in just a couple of weeks for a merienda pop-up: a snack-style meal served between lunch and dinner. The merienda pop-up menu will feature items such as pancit sotanghon guisado – savory sautéed mung bean noodles; ukoy – sweet potato and shrimp fritters; and lumpiang shanghai – crispy spring rolls, also known as Filipino food’s gateway drug. Items will range from $5.00 to $8.00. During the pop-up, Dolcezza will be serving Filipino-inspired gelato and sorbetto behind the tasting room counter. Philippine cuisine is a crossroads cuisine. It layers Malay, Chinese, Spanish, Mexican and American influences. Bad Saint will pay homage to the deep roots of Filipino food using the bounty of the Mid-Atlantic. Co-owners Genevieve Villamora and Nick Pimentel and Chef Tom Cunanan are the Filipino Americans behind Bad Saint. Together they bring over 25 years of local restaurant industry experience to the table, along with an evangelist’s zeal for Philippine cuisine. When: Sunday, November 9 from 3:30 p.m. to 6:00 p.m.
More Progress at Bacon Funeral Home – Bye Bye Boarded Up Windows! !